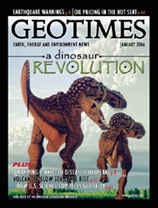 Which earth science issue is most on your mind heading into the new year? 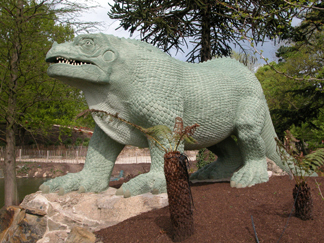 The study of dinosaurs has come a long way from its early days in 19th century England, undergoing a renaissance of discovery in recent years. Over the past 200 years, artists have altered their portrayal of dinosaurs from sluggish lizards to energetic ancestors of birds, in step with scientific discoveries. Dinosaur footprints have revolutionized our understanding of the ancient beasts  from how fast they ran to where they lived. Myths reveal the earliest explanations people sought for ancient creatures, from gold-guarding griffins to one-eyed monsters. American students need to keep up with their international peers in math and science if they are to stay competitive globally. Connecting people to the struggle to understand geologic time is key to effectively communicating about Earth. A look at the history of the U.S. federal disaster agency can inform the debate over the future direction of governmental disaster response. Heading into the new year, several geoscience issues rise to the top as important trends to track. The Spindletop site in Beaumont, Texas, becomes the first major U.S. oil discovery. This depiction of a pair of Late Cretaceous Tyrannosaurus rex individuals at full run continues to remain controversial, as it shows that the giant bipeds could achieve high speeds. Paleontologists who once viewed dinosaurs as slow behemoths now depict them with a wide range of energy levels and with higher accuracy, based on new discoveries. Illustration by Greg Paul.